Notice how, every time he mentions something that you can only currently do using a native app, you either tell yourself that it’ll soon become possible to do that without one, or you find yourself working out how you would do it without one. I’m not sure how owning a phone business will change anything that Google has to say about their own native vs. web app choices, but that may be a question they are asking themselves right now. 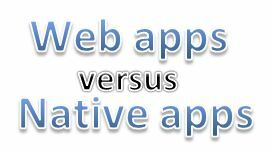 They could, I imagine, consider adding exclusive new features to the phone in a way that could give Android native apps a ‘lead’ over both web apps and over native apps on other platforms. I wonder they would talk about that in a ‘comparison presentation’ in future. And if you think that cross-platform app development sounds daunting because it requires you to put together a horrendous testing setup, how about doing all of your testing in the cloud, using simulated phones? Agile methodology applied to non-technology: success shock! What if a time-travelling, pre-Apple Jobs & Wozniak applied to Y Combinator without a startup idea? Why do startup accelerators get into trouble?